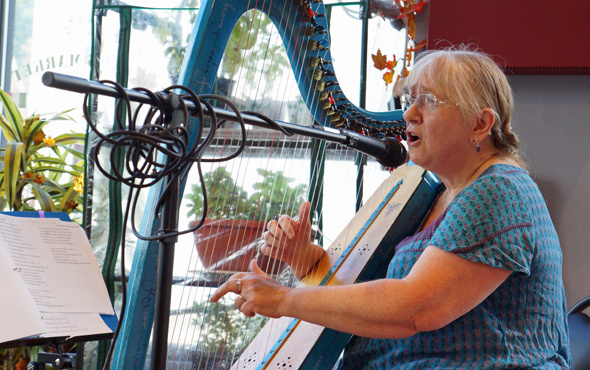 Janna Maria Frohlich played the harp and sang at Tony's Market as part of Roslindale Porch Fest today. Across the neighborhood, on porches, in backyards and at Tony's, people gathered for the annual neighborhood music festival. Singing jazz with the Patrice Monahan Trio on Orange Street: Read more. On Beech Street, homeowner Jen Goldston joined in with one of them there City Ducks: Read more. 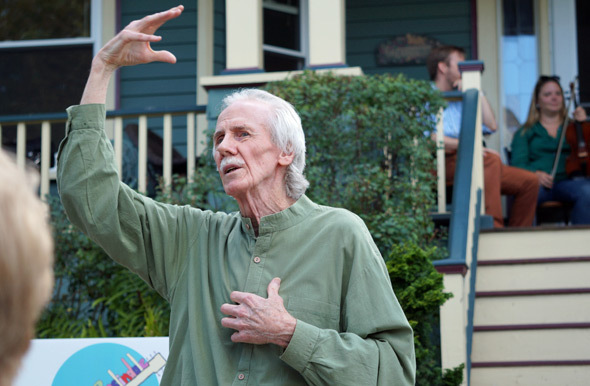 Alan O'Hare told tales of his trips to the auld sod (tip: Don't bring a map, just ask for directions, and you'll be well taken care of) on Primrose Street this afternoon as part of Roslindale Porch Fest. In between his stories, Colin Kadis and friends played Irish instrumental tunes as 20 or so people listened: Read more. Feeling the Klezmer on Washington Street. Some 45 groups and individual musicians performed across Roslindale today in the first Roslindale Porch Fest. Mark O'Neill took in several performances: Read more.